San Francisco Public Golf Alliance : On-line bidding for the silent auction is now closed. Thanks to all who participated. On-line bidding for the silent auction is now closed. Thanks to all who participated. 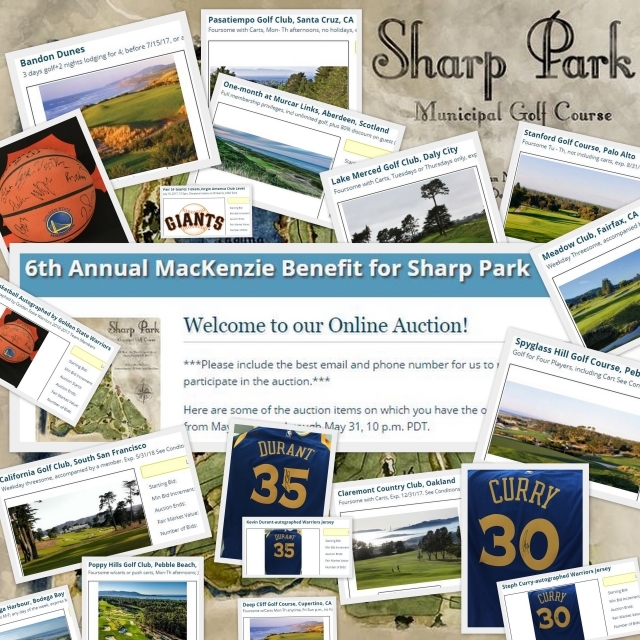 The Sixth Annual Alister MacKenzie Benefit Tournament to Save and Preserve Sharp Park is Saturday, June 3, but on-line bidding for the silent auction is open now! UPDATE: On-Line bidding for the silent auction closed at 10pm PDT Wed May 31. The silent auction will continue in-person at the tournament at Sharp Park on June 3. Great courses, great values and Golden State Warrior collectibles are among the fantastic items you'll find in this year's auction. Bid on: Three days of all the golf you and your foursome can play plus two nights lodging at America’s No. 1 golf resort – Bandon Dunes; A foursome at the ultra-private Friar’s Head Golf Links on Long Island – ranked #19 in the newest Golf Digest list of America’s greatest course; A one-month international membership with unlimited golf plus guest privileges at Murcar Links in the dunes by the North Sea adjacent to Royal Aberdeen in Aberdeenshire, Scotland. And then there are foursomes at Spyglass Hill, Pasatiempo, Poppy Hills, Pacific Grove, Meadow Club, Cal Club, Claremont, Stanford, Silverado, Lake Merced, Mira Vista, Callippe Preserve, Poppy Ridge, Wente Vineyards, Presidio, Bodega Harbour, Foxtail, Crystal Springs, Metropolitan, and you name it. The Warriors have tossed-in a 2017 team-autographed basketball, plus Warriors jerseys signed by Steph Curry and Kevin Durant. All these auction items are thanks to the generosity of our sponsors and fellow-members of the San Francisco Public Golf Alliance. All auction proceeds go to our ongoing campaign to Save Sharp Park. Thank you in advance for your participation and generous support for the cause. The auction will open for online bidding May 24 Noon PDT and will close on Wednesday, May 31 10pm PDT. The auction will then continue in-person only on June 3rd at Sharp Park, at the Sixth Annual Alister MacKenzie Tournament to Save Sharp Park. The highest bid from the online auction will serve as the starting bid at the June 3 in-person silent auction at Sharp Park. The winning bidder will be the highest bid - whether online or in-person - as of the close of the in-person auction on June 3rd at 7:30pm PDT. We will be contacting highest online bidders on June 1-2 to confirm your bid with a credit card. Please be sure to include the best phone number and/or email for us to reach you when you sign-up to participate in the auction, and have your credit card handy for pre-authorization over the phone or email. All proceeds from the auction will go to our ongoing campaign to Save Sharp Park Golf Course. Thank you in advance for your participation and generous support for the cause. Click on the menu or login button on the top-right of the webpage, or open any auction item, and then click, "Create an Account." It is important that we communicate with you via phone or email BEFORE 6pm PDT on June 2 to confirm your online bid and obtain your credit card information; otherwise, we may not be able to honor your online bid. If your bid is the final winning bid at the in-person auction, then your credit card will be processed for payment; if your bid is not the winning bid, then you will not be charged, and your credit card information will not be saved. Please include the best email and phone number for us to reach you when you sign-up to participate in the auction. Thank you for your generous support for the cause and good luck. Let the bidding begin! The 6th Annual Alister MacKenzie Tournament to Save Sharp Park is hosted by the San Francisco Public Golf Alliance, Sharp Park Men's and Women's golf clubs, Pacifica Historical Society, Pacifica Chamber of Commerce and the Alister MacKenzie Foundation. The San Francisco Public Golf Alliance's goal is to nurture and defend affordable, eco-friendly public golf in San Francisco for future generations by encouraging public golf throughout all segments of the community, and by caring for San Francisco's heritage public golf courses. One of these is Sharp Park, an historic seaside links, designed by the preeminent architect Alister MacKenzie, who also designed Augusta National, Cypress Point, and many of the world’s most highly-esteemed courses. Sharp Park is one of MacKenzie’s rare public courses, and together with the Eden Course at St. Andrews, his only seaside public links.